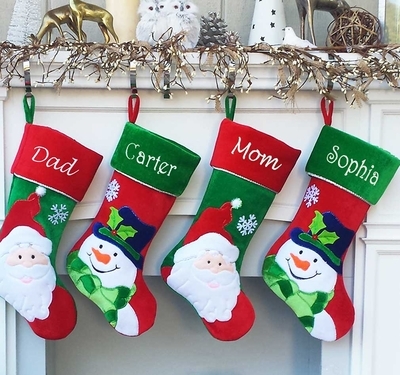 CHoice of happy jolly Santa Stocking or Happy Snowman Stocking Design. These Happy Christmas Character Velvet Stockings can be personalized in our metallic embroidery thread. Measurements: Measured along the diagonal from the top left hand corner to the toe, the stocking measures 18.5 inches, and the width along the cuff is 7.5 inches. Materials and Design: The body and cuff of this Christmas stocking is made out of velvet and the appliques are framed in metallic embroidery matching the colors. The inside lining is in matching color satin. The stocking is also padded inside between the lining and the exterior velvet, which gives the stocking soft feel, it holds its shape very nicely - just a superior quality workmanship! Choice of fonts: Embroidery Script or Embroidery Block or Christmas Hand Fonts. Please CHeck images for font selection and examples. These stockings also make a set with our Santa Claws, Santa Paws Cat and Dog Stockings, as well as with Red Snowflake and Blue Snowflake Bling Stocking and Fishing Santa. See additional images for examples.